Composition software for guitar, bass and drums. If you're a guitarist, you want a guitar-centric approach to creating sheet music. Progression 3 lets you enter tab and notation more easily than ever and hear your music played back with real instrument samples. New features include effects from PreSonus Studio One, an enhanced chord library, and a custom chord editor and capo feature. 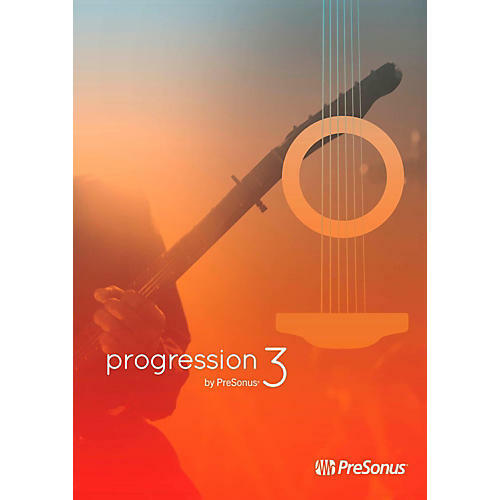 Progression makes short work of creating your own guitar tab, lead sheets, and standard sheet music-complete with your audio track. Juice your musical ideas using tablature, notation, or both, with drag-and-drop functionality and an interactive fretboard. Progression instantly and seamlessly integrates your score with real audio samples performed by professional musicians at top studios. Progression is 64-bit compatible, comes with VST-hosting capabilities, and offers full ReWire support.